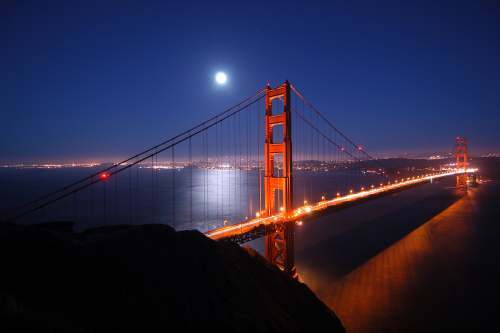 Cheap flights to San Francisco should be available on some of the many domestic and international airlines which serve San Francisco International Airport. It's a major west coast hub, like Los Angeles. For anyone planning to drive the Pacific Coast Highway, a cheap flight to San Francisco is a good starting point, if you can get one. Low-cost airlines flying to San Francisco include Southwest Airlines, SkyWest, Virgin America, and JetBlue. Just a few of the many major international carriers are Air Canada, Air China, Air France, Air New Zealand, British Airways, KLM, Lufthansa, Qantas, and Virgin Atlantic. Major US airlines flying into San Francisco include American Airlines, Continental, Delta, United Airlines, and US Airways. San Francisco airport (code: SFO; tel: 800/435-9736 or 650/821-8211; website: http://www.flysfo.com) is ideally located for driving south down the Pacific Coast Highway. It's right on Highway 101, near the junction with Highway 380, about 13 miles south of the city center. Rather than take 101, though, we recommend taking 380 then 280 North, then take Exit 47 onto CA-1 South, cutting across to the coast to start your Pacific Coast Highway drive that way. It should only be a 15-20 minute drive and you'll be seeing the ocean, and there are plenty of car rental places at the airport if you want to collect a hire car there. Many international airlines use San Francisco International, which increases the chance of finding a budget flight bargain. In addition to the airlines mentioned above, some of the other international carriers are Air Berlin, Singapore Airlines, the Central American airline TACA, Swiss International Air Lines, Philippine Airlines, Aeroméxico, Mexicana, LAN Peru, Korean Air, Japan Airlines, All Nippon Airways, Emirates, EVA Air, Cathay Pacific, and Asiana Airlines. As well as Air Canada, there are seasonal low-cost flights on WestJet to San Francisco from Calgary, Edmonton, and Vancouver. Some of the best options for cheap flights within the USA will be with Southwest Airlines, who fly to San Francisco from Chicago, Denver, Las Vegas, Los Angeles, John Wayne Airport in Orange County, Phoenix, and San Diego. AirTran Airways, who fly to San Francisco from Atlanta and Milwaukee. Alaska Airlines, flying not only from Anchorage but also Palm Springs, Puerto Vallarta, San José del Cabo, and Seattle. Frontier Airlines, from Denver and Milwaukee to San Francisco. Hawaiian Airlines, between San Francisco and Honolulu. Horizon Air, linking San Francisco with Portland, Oregon. JetBlue Airways, from San Francisco to Austin, Boston, Fort Lauderdale, Long Beach, and New York. Sun Country Airlines, seasonally from San Francisco to Minneapolis/St. Paul. United Express, serving numerous US destinations. Virgin America, flying to Boston, Fort Lauderdale, Las Vegas, Los Angeles, New York, Orange County, San Diego, Seattle, and Washington-Dulles. If you want to drive the Pacific Coast Highway in one direction to or from Los Angeles and fly back, then cheap flight options include Southwest Airlines, who fly to both Los Angeles and John Wayne Airport in Orange County, Virgin America, and JetBlue, who fly San Francisco-Long Beach. Other airlines flying the route and who might be worth checking for special offers are American Airlines and United. For more information visit our Cheap Flights to Los Angeles page. Southwest Airlines, Virgin America, and United all fly between San Diego and San Francisco. Also check our Cheap Flights to San Diego page. Alaska Airlines has flights between San Francisco and Seattle, and so does Virgin America. United Airlines also fly this route and could be worth checking for any cheap flights to San Francisco that they might have on special offer.